Join us for an artist workshop. You will love it! No experience required. 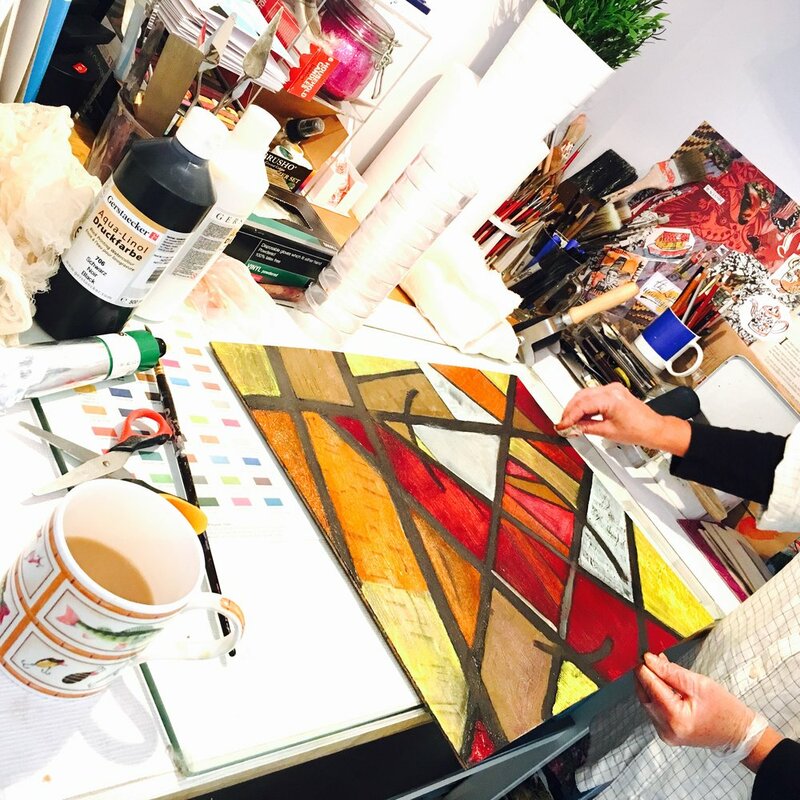 Private evening workshops — BYOB! Bed and Breakfast for weekend trips and private classes. Gift Certificates. Private Studio Time for printmakers. Why not try your hand at something NEW! ... one of those things to do on your never ending bucket list or create a lasting memory from your Hen Party!! Simply gather two or three friends and call Georgie on 07745 887 085 to arrange a mutually convenient morning to run a workshop in Burton Leonard Village Hall. 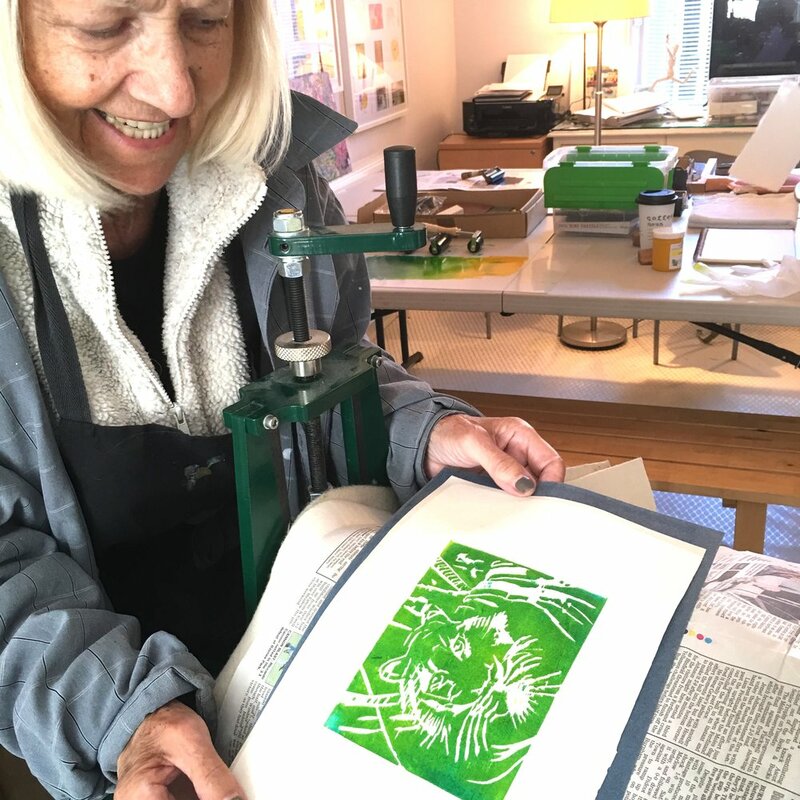 Have a natter and enjoy your introduction to Linocut printmaking in a very relaxed setting. You will take home several simple prints to frame! Cost is £30.00 and includes all materials, coffee, cake and a whole lot of fun! If you’d like to take part in a workshop and are from further afield, do come and enjoy the splendours of gorgeous North Yorkshire with Harrogate quoted as being “the happiest place in the UK to live” and enjoy the best it has to offer. B&B is available in the village of Burton Leonard. Email or call to ask for details! Invite your friends for a private evening workshop. A birthday celebration or just a night out with friends. Feel free to Byob! Choose from: "Introducing you to the joys of Printmaking” "Painting and Mixed Media" or "try your hand at Collage". (4 people max) £120 total. Includes 2.5 hour workshop, all materials, the finest nibbles and a lot of fun! Book a session for just you and your friends at a time that will suit everyone. Contact us to schedule your private workshop. We will help you plan a daytime workshop with your friends or colleagues. 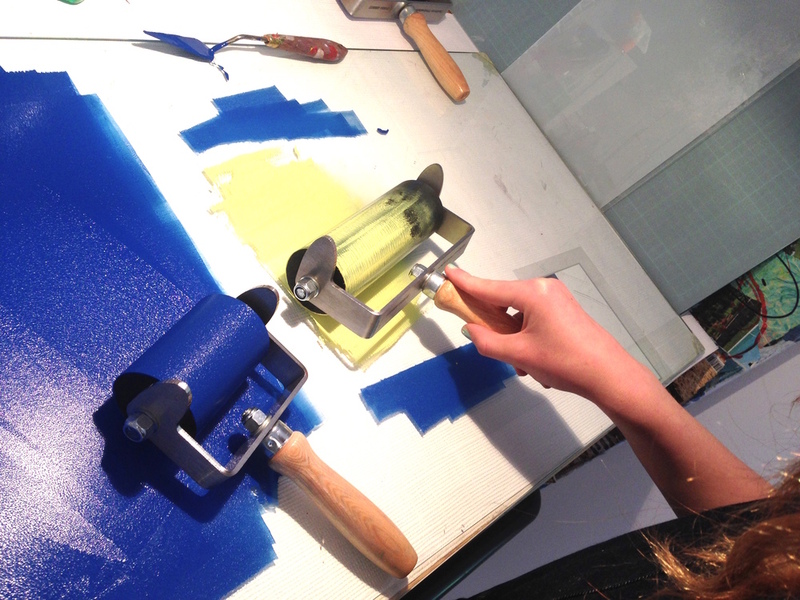 Choose from: "Introducing You to the Joys of Printmaking” "Painting and Mixed Media" or "Try Your Hand at Collage". (6 people max) £180 total. Includes 2 hour workshop, all materials, tea, coffee, biscuits and a lot of fun. Book a session with your friends or as a team building event at a time that will suit everyone. If you are an experienced printmaker and would like to utilize our press, we make it available by the hour. Sole use of Hawthorne Etching Press bed size 950mm x 400mm. Your own materials are necessary. Time slots are available upon request at mutually convenient times. Email or call to book. Gift certificates make wonderful presents for those you just can’t think of what to buy. An experience they will always remember. Check out our Kids/Teens Workshops!